Workshop #1 will focus on exploring ideas, needs and goals of the community. Thursday, August 30, 2018, 6:00 p.m. to 8:00 p.m.
Workshop #2 will discuss economic and market forces, and will include activities using maps and boards. Thursday, September 27, 2018, 6:00 p.m. to 8:00 p.m.
Workshop #3 will evaluate alternative concepts from previous workshops. Thursday, October 25, 2018, 6:00 p.m. to 8:00 p.m. 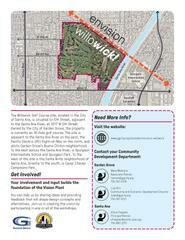 The Willowick Golf Course site is located at 3017 West 5th Street in Santa Ana. Owned by the City of Garden Grove, the property is currently an 18-hole golf course. In 2017, the Cities of Santa Ana and Garden Grove held a joint study session to discuss the potential redevelopment of Willowick Golf Course. In 2018, the Santa Ana City Council approved an agreement with the City of Garden Grove for both cities to create a vision for future development involving community outreach. 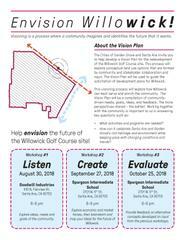 The visioning process will help both cities better understand how Willowick can best serve and enrich the community for current and future generations, including determining what activities and land-uses are needed, and how it can keep pace with changing conditions and trends. RSVP’s for the community workshops are not required. For more information, visit ggcity.org/econdev/envision-willowick or contact Marc Morley, City of Santa Ana Economic Development at (714) 647-6588 or mmorley@santa-ana.org.